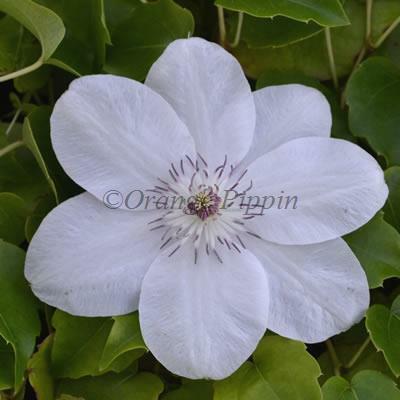 Clematis 'Miss Bateman' has been a favourite that has been going for over 100 years. Creamy satin-white flowers with a delicate suggestion of silver are enhanced and distinguished by lovely red centres during May, June and again in September. This non-evergreen climber can be grown against a trellis, garden fence, wall, arches, pillars, pergolas, clambering over tree stumps and through large shrubs or planted in a container trained up bamboo canes or an obelisk. Clematis 'Miss Bateman' was raised by Charles Noble of Sunningdale, England. It was named after Catharine Bateman, daughter of the orchid specialist James Bateman.